The Timber Trade Federation opened their Timber Transformer exhibition at the London Building Centre on 5th February. 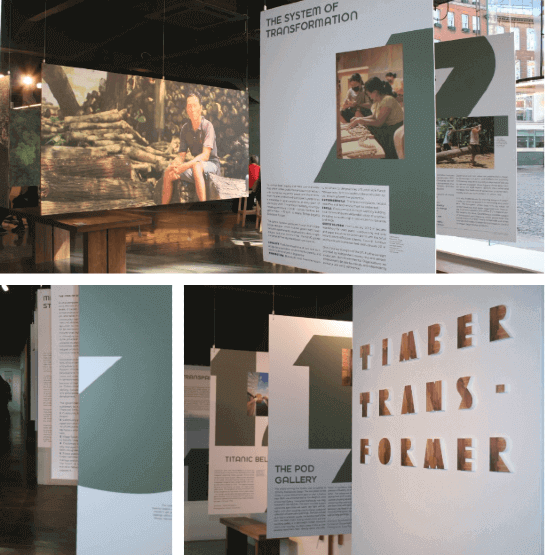 Timber Transformer is an exhibition that tells the story of a 15-year journey to change the political, social, economic and environmental landscape of Indonesian forestry. The show examines the diplomatic agreements and country-wide process that culminated in Indonesia becoming the first country to issue a newly formed FLEGT (Forest Law Enforcement Governance and Trade) licence, ensuring their timber comes only from well-managed, well-regulated forests. Meyer were delighted to show their support to Indonesia and this landmark achievement and be part of the exhibition. Our 12mm Marine Grade Indonesian plywood was used to screen print forest landscapes directly onto full sized boards with impressive results. Meyer are proud to be one of the biggest names in the UK timber industry and responsible purchasing is an essential core value of our business. We remain committed to promoting forest governance, sustainable forest management and ensuring the success of FLEGT. The exhibition will be open until the 27th April 2018.